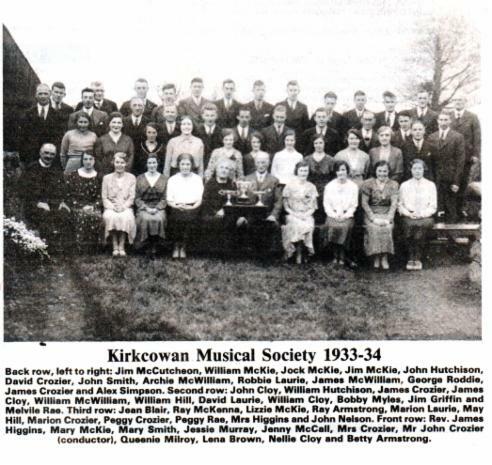 Kirkcowan has a long tradition of musical history, much of it thanks to John Crozier, who formed the Kirkcowan Musical Society whose first performance was on 27th March 1903. 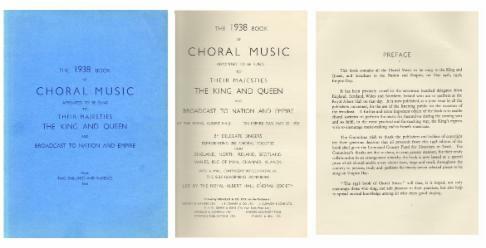 In order to accompany the choir he persuaded family and friends to learn to play musical instruments for his orchestra. Quite an achievement for such a small village. Jim McKie later made a tremendous contribution working with the junior choirs. 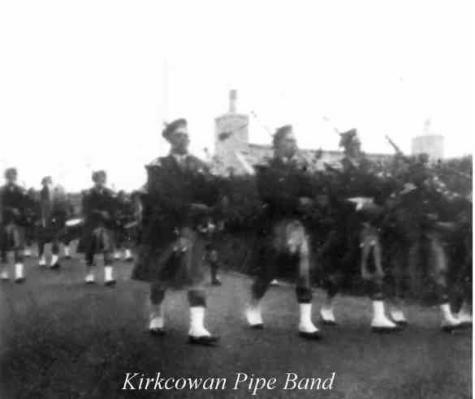 In the late thirties/early forties Samuel Stewart with Donald McAuley set up Kirkcowan Pipe Band with Samuel as the Pipe Major. Through the years a number of local men have played in dance bands and groups. Back Row: Jim McCutcheon, Jim McKie, ? ?, John Laurie, Jimmy McWilliam, Melville Rae, George Roddie, ?? Row from back: Men -? ?, ??, ? ?, John Smith, ? ?, ??. Back Row Ladies: ??, ? 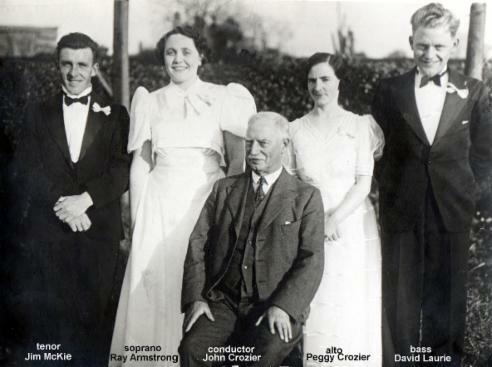 ?, Betty McKie, Ray Armstrong, Agnes McCall, Margaret Laurie, ? ?, Emily McKie, ? ?, Peggy Crozier, Molly Armstrong. Front Row Ladies: ? ?, Mary McKie, Lizzie McKie, ? ?, Bet McCutcheon, ? Young, Mabel McKie, Marion Crozier Lena Brown, ??. 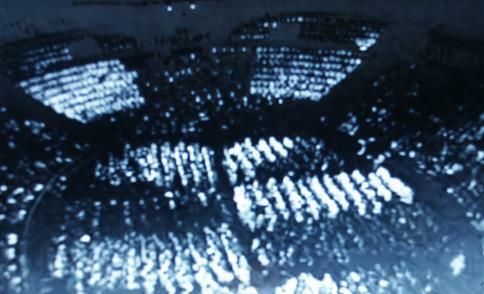 Front Row Seated: ? ?, William Hutchison, John Crozier, David Laurie, John Cloy. The choir continued to represent Kirkcowan at music festivals with many winning appearances . Back: John McKie, Jim McCutcheon, John Smith, John Dickson, Burnie?, Goerge Roddie, Jim Crozier. 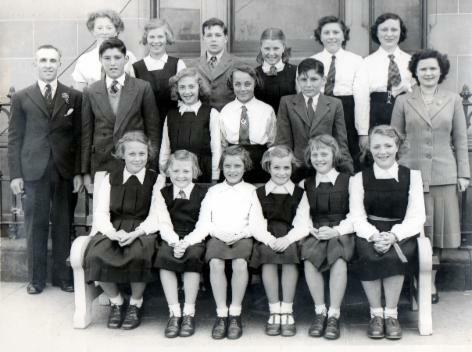 Middle: Lily McKie, ?, Bob McCutcheon, Peggy Rae, Jim McKie, Marjorie Burnie,Jimmy Cloy, Peggy Crozier, Chris Dickson, Mary Irvine?, Netta Ferries, ?Stewart. 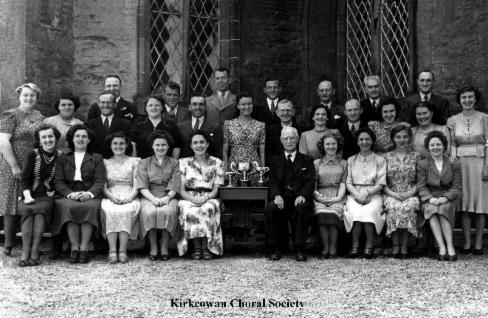 Front: Molly Stewart, Mary Stewart, Jean Stewart, Jean :Paterson, Ray Armstrong, John Crozier (Conductor), Nancy Dickson, Marion Crozier, Grace McKie, ?Dickson. Back: John Smith, John Dickson, Jim McKie, Jim McCutcheon, John McKie, Jimmy Cloy, Jim Crozier, Bob McCutcheon. Middle: Lizzie McKie, Margaret Young, Lily McKie, Margaret Rae, Mollie Love, Marjorie Burnie, Aileen Morland, Peggy Crozier, Emily McKie. 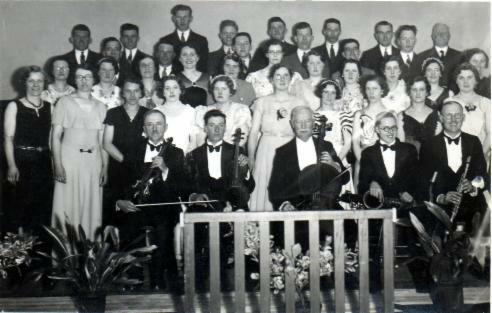 Front (seated) : Queenie Blacklaws, Marion Crozier, Nancy Dickson, John Crozier (Conductor), Margaret Hyslop, Netta Ferries. 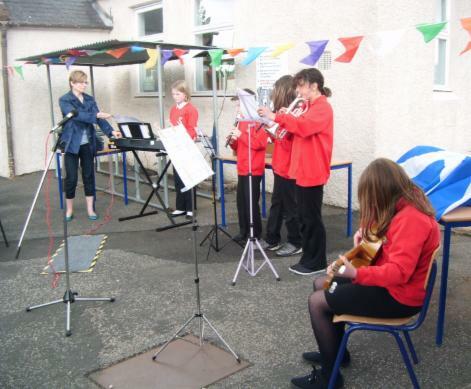 Jim McKie also formed and conducted a junior choir which had similar success at music festivals in the area. 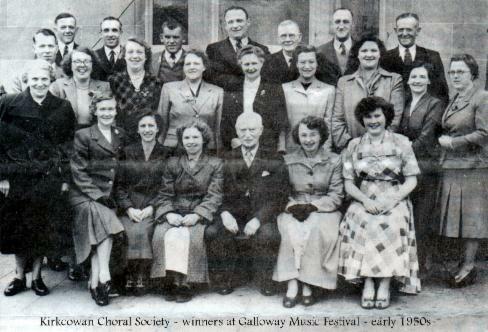 Two following photos were taken outside the McMillan Hall in Newton Stewart at Music Festivals in the mid 1950s. 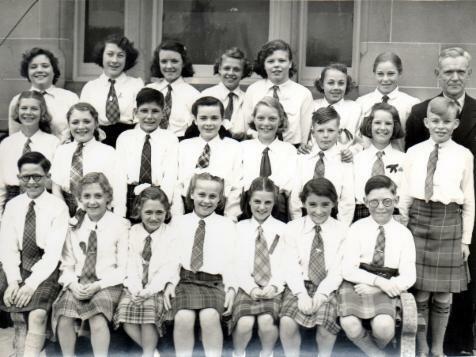 Back: Nancy Cloy, Fiona Munro, Willie McCutcheon, Mary McLean, Helen McWilliam, Pamela McCrorie. 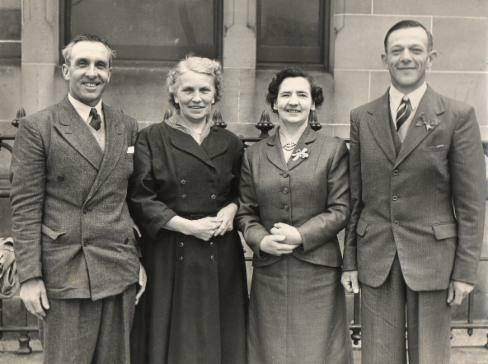 Middle: Jim McKie (conductor), Tom McGeoch, Elsa McKie, Mabel McKie, George McGeoch, Jean Paterson (Pianist). Front: Maureen Griffin, Morag Cloy, Jean McGeoch, Lavivia McCutcheon, Margaret Griffin and Jean Anderson. Winning Certificate in front of photo. Back: Mary McLean, Fiona Munro, Jean Anderson, Margaret Anderson, Beatrice Drysdale. Middle: Jim McKie (conductor), Mabel McKie, Helen McWilliam, Elsa McKie, Erica Watson, Maureen Griffin, Mary Mathews. Front: Lavinia McCutcheon, Betty Lamont, Doreen Ferries, Jean McGeoch, Margaret Griffin, Morag Cloy, Muriel McGoth. Around the same period there was also a school choir and many of the children were in both choirs. 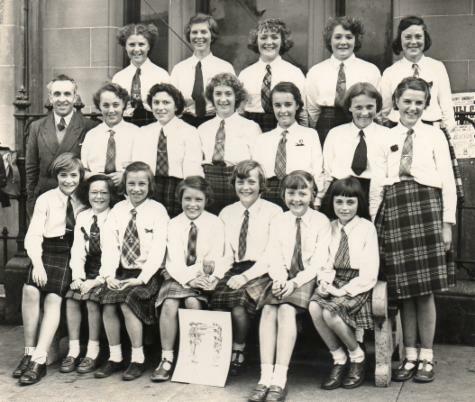 Back: Betty Rennie, Mary McAuley, Elsie Kirk, Rita Dickie, Helen Christie, Mabel McKie, Mary Ferries. Middle: Fiona Munro, Jean Anderson, George McGeoch, Sheena Blacklaws, Nancy Scott, John McCutcheon, Rae Curran, Willie McCall. Front: sam Paterson, Elsa McKie, Margaret McGoth, Maureen Griffin, Mary Mathews, Madge Murphy, John Love. 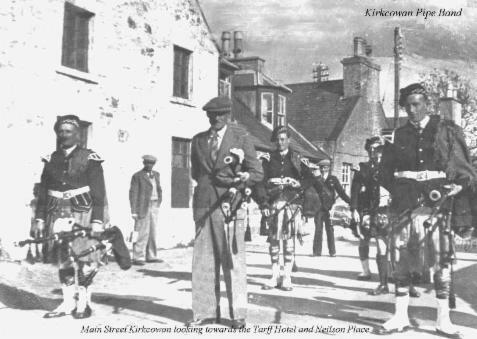 Samuel Stewart moved to Kirkcowan from Elrig (Lane of Mochrum) in 1935 and shortly after created Kirkcowan Pipe Band with the help of Donald McAuley who took over as Pipe Major when Samuel retired. The band played around the area and individual members played solo gigs - Samuel Stewart often played for Betty Forester's dancers in Newton Stewart and accompanied their float at the Galloway Pageant. After the wedding ceremony of Elspeth Mary Hamilton (Craighlaw) the couple were piped to their car by Pipe Major Donald McAuley and Piper Robert Stewart, both from Kirkcowan. L to R: Samuel Stewart (Pipe Major), David Wright snr (Collections), ? ?, Donald McAuley jnr, ? ?, Bob McCutcheon, Mary McAuley (partially hidden), Jimmy Smith outside the former Tarff Hotel.